Do you take a multi-vitamin? That’s great, but how do you know you’re getting the proper nutrition? Many who take a multi-vitamin are doing little more than producing expensive urine. That’s because multi-vitamins are a one-size-fits-all formula. You may not be getting certain nutrients or micronutrients you need. Which is why at Family First Chiropractic, we conduct a series of diagnostic tests to find out. It starts with our 4-page symptom analysis. Many of our patients remark that it brings up issues that they thought were “normal.” Besides giving us valuable clues, you’ll be more mindful than ever about your overall health. We will also perform a ZYTO Biocommunication Scan. You’ll place your palm on the scanner. As your body to reacts to subtle energetic impulses it can reveal the most promising treatment plan. Cardiovascular disease is the number one killer in the US. We would be remiss if we overlooked the condition of your arteries. Our Smart Pulse instrument measures the blood flow in your finger. It reveals the flexibility of your arteries. Do you have a healthy ratio between Omega-3 and Omega-6 levels in your body? Most people on a Standard American Diet have skewed results, resulting in inflammation. Better health begins with knowledge. Muscle testing is based on the time-tested principles of Applied Kinesiology. 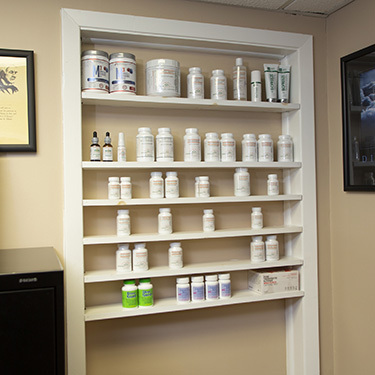 We’re able to test your body’s reaction to various supplements and determine proper dosage. Serious about getting well and staying well? Good nutrition is essential. Let’s create an individualized nutritional support plan just for you.